In the US, The National Hockey League (NHL) is the fourth most-watched sport; in Kenya, there is only a single ice rink. So when lifelong hockey players Ricky (9) and Timmy (4) Lipsey travelled to Nairobi in March to visit its sole team, the Ice Lions, they brought not only donations, but also their shared passion for the sport. The Ice Lions became a success story in the hockey world after a video with renowned hockey player Sidney Crosby was released in the fall of 2018. The team has since received equipment and thousands of dollars in donations, and has had the opportunity to visit the United States and Canada to play against other teams. Throughout the past year, Timmy Lipsey’s own youth hockey team has raised money for the Ice Lions by soliciting donations from friends and family and wearing Ice Lions stickers on their helmets. In March, the Lipseys not only delivered the money they had raised in person, but also participated in a game against the Ice Lions with two-time Stanley Cup Winner and legendary Russian hockey player Slava Fetisov. It was part of a worldwide series called “The Last Game,” a United Nations (UN) initiative created to raise awareness of climate change and the risks posed thereby, Ice Lions captain Ben Azagere said. As an ice hockey team centered in a city with an average high of 76ºF the Ice Lions are an unlikely success story. They are the only such team in East Africa and play on the only ice rink in East Africa. Azagere started playing ice hockey in 2012 when he heard about the sport from American and Canadian friends working at embassies in Nairobi, he said. Before he played hockey, he frequently rollerbladed, a popular activity in Nairobi. That had already given him an idea of what to do once he got on the ice. After four years, Azagere had gathered a relatively stable team of 20 to 30 players, many of whom had previous experience rollerblading as well. As Facebook has become increasingly popular in Kenya, Azagere used social media to help him recruit, but he still had trouble attracting Kenyan players. The ice rink is owned and operated by The Panari Hotel in Nairobi, and while they have been increasingly generous towards the Ice Lions, the rink’s price of admission has impeded some new players from joining. Faith Siholo, one of the two women on the team, started watching the Ice Lions practice last January. She learned of the team from some of her rollerblading friends, and after watching a few scrimmages, Azagere asked her to put on a pair of skates and try it out, Siholo said. Tim Colby, who helped establish the team while working for the Canadian embassy in Nairobi, first became involved with the Ice Lions when Azegere approached him for advice on coaching and organizing the team, he wrote in an email. The team became well known in Western media when the Ice Lions were invited to fly to Canada to receive new gear and have the opportunity to play with Sidney Crosby, a legend in the hockey world, along with other Canadian hockey players, according to ESPN. After videos of the experience were shared across social media last fall, the Ice Lions numerous new sources of funding and gear donations. “The Kenyans are not just showing up to smile for pictures; they are very serious about hockey and about becoming good hockey players, especially to improve the future generations,” Rick Lipsey P’ 22 P’27 P’28 said. Azagere’s dream is to establish different hockey clubs around Kenya and East Africa to start a hockey league, he said; right now, the Ice Lions mostly divide themselves into teams and play against themselves for matches, except when there are visiting teams. As part of that mission, he is looking towards the youth, specifically primary schools. 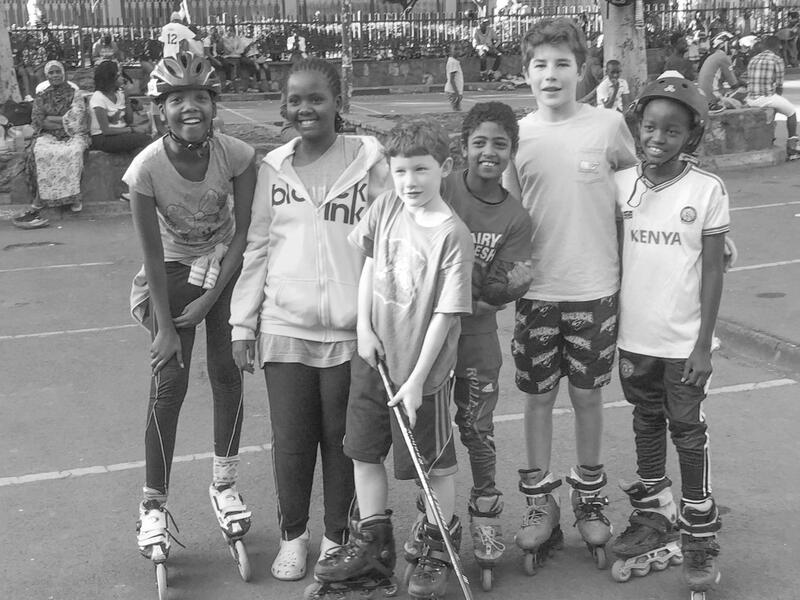 The Ice Lions have helped establish roller hockey teams at schools around Nairobi whose players occasionally visit the ice rink to practice on ice. Ricky Lipsey began playing ice hockey at a rink in Central Park when he was four, and today, he plays travel and club hockey all year round, he said. “My favorite part about the sport is the teamwork, the fast pace and all the components that go into it like the passing, shooting, and stick-handling; every aspect has to work together to make a good hockey player,” he said. His current team is especially tight-knit and has been playing together for a long time, Ricky Lipsey said, so every player knows each other’s game, he said. “We all know each other’s strengths and weaknesses, so if one person lacks something, someone else will have it, and everybody works together to balance everything out,” Lipsey said. Timmy Lipsey (4) has been playing ice hockey since he was three and a half, and he became a goalie when he was six. “I started playing mainly because of my dad; Ricky was playing hockey at that time, so I think that’s what led me into wanting to try it out,” Timmy Lipsey said. Ricky and Timmy’s father, Rick Lipsey, played hockey in high school at the Rye Country Day School; he then played intramural hockey for four years and was captain of the golf team at Cornell University, Rick Lipsey said. “I grew up playing golf and was involved with golf as a competitor and a teacher, so golf was always one of those things that allows you to go anywhere in the world and open up doors for work, for friendship, for community service, and now hockey has kind of taken on a similar role for our family,” Rick Lipsey said. Rick Lipsey also worked at Sports Illustrated for 20 years as a writer specializing in golf, and he now plays recreational hockey at Riverbank State Park twice a week. After months of fundraising, Rick, Ricky, and Timmy Lipsey travelled to Nairobi to present a check along with gear donations to the Kenyan Ice Lions. As manager of Timmy’s hockey team, North Park Hockey, Rick Lipsey organized a season-long fundraiser for the Ice Lions, in which donors pledged to give one dollar for every goal Timmy’s team scored and two dollars for every victory. With two games every weekend from October to March, the team raised approximately $4,500 dollars, Rick Lipsey said. Rick Lipsey also designed Ice Lions logo stickers which the players wore on their helmets during every game. Throughout the season, Rick Lipsey kept in touch with Tim Colby, a Canadian UN staffer living in Nairobi who is the head of the Ice Lions program, as well as other players on the Kenyan team. North Park Hockey donated a portion of its Annual Appeal to the Ice Lions, and that amount, combined with individual donations from friends and family as well as the money raised by the team, came out to be a sum of $12,000, Rick Lipsey said. The monetary donations they gave to the Ice Lions are going towards a new locker room for the team, Azagere said. Ricky Lipsey believes the storage locker will be helpful to store gear and donations in such a small facility, he said. Ricky Lipsey and his brother also reached out to multiple hockey retailers, Howie’s Hockey Tape, Renfrew and Pure Hockey, for donations of tape, equipment, and apparel to bring to the Ice Lions along with the check, he said. As soon as they arrived in Nairobi, Ricky and Timmy began playing street hockey in the parking lot of the airport with some of the luggage clerks, Rick Lipsey said. “We also went to downtown Nairobi and played street hockey; every Sunday, they have hundreds of people who gather in a parking lot and play street hockey and roller hockey and do inline skating, so we spent some time there,” Rick Lipsey said. Another highlight of the trip was going on a safari in Nairobi National Park, where they saw a variety of animals, including lions, zebras, and white rhinoceroses, Timmy Lipsey said. The family also toured the Nairobi Railway Museum, which demonstrates the whole history of the modernization of Kenya through railways, Rick Lipsey said. The Giraffe Center was another highlight of the trip; according to its website, the Center is a non-profit organization created to educate Kenyans about their country’s wildlife as well as to provide international visitors the opportunity to come in close contact with giraffes. In Nairobi, Timmy Lipsey was surprised by the amount of guards and soldiers carrying machine guns working as security guards at places like malls, the national parks, hotels, and grocery stores, he said. “I also thought it was interesting that you have to drink bottled water or boil the water in Nairobi, because they don’t have the same filtering service that we have,” Timmy Lipsey. Meeting the Ice Lions and playing hockey with them and Fetisov was the highlight was the trip, Timmy Lipsey said. “I learned that through the sport of hockey there’s so much you could do; it’s not just the little world of us, Canada, or Finland,” Timmy Lipsey said. While his season is over and the future connection between his team and the Ice Lions remain unclear, Timmy Lipsey hopes that they might return to Nairobi with more money or gear, he said. Fetisov plans on visiting New York later this month, and he has already reached out to the family about meeting up, Rick Lipsey said. From this trip, Timmy Lipsey said he learned more about climate change as well, he said. While in Nairobi, Ricky and Timmy played in “The Last Game,” a UN-sponsored initiative to raise awareness of the risks presented by climate change. The Game came a week before the fourth session of the UN Environment Assembly that gathered in Nairobi from March 11 to 15. Hockey player Slava Fetisov, the UN Environment Patron of the Polar Regions, is helping to spearhead The Last Game initiative. He played on Timmy and Ricky’s team during the Game against the Ice Lions, Timmy Lipsey said. While playing for the same team Fetislov and Timmy became fast friends. While Timmy Lipsey knew that Fetisov would be involved in the initiative, he didn’t realize they would become such good friends, Timmy Lipsey said. “[The game] was definitely one of the best experiences I’ve had with hockey, and it’s cool to say that I played with one of the most famous hockey players in the world and that I played a hockey game in Nairobi, Kenya where it goes to around 100 degrees,” he said. Directly after the game, the UN Ambassadors participating in the game held a press conference about The Last Game initiative directly on the ice. “I was just watching [the press conference] from the side, but it was cool to see how interested the Kenyan news sources were in this growing sport of hockey,” Timmy Lipsey said. The UN also sponsored a documentary film being made about the series of games, Rick Lipsey said. The film advances awareness of the risks posed to people’s lives by climate change already and in the future. Hockey specifically has a special connection to preventing climate change, as with a greatly warmer climate there would be less ice, and less ice would mean less hockey. It was great to see the Ice Lions’ enthusiasm for not only playing for themselves, but simply just for the sport, Timmy Lipsey said.